The author of the bestselling You Are Not So Smart gives readers a fighting chance at outsmarting their not-so-smart brains. 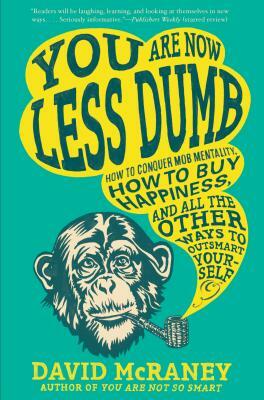 A mix of popular psychology and trivia, You Are Now Less Dumb is grounded in the idea that we all believe ourselves to be objective observers of reality--except we’re not. But that’s okay, because our delusions keep us sane. The Benjamin Franklin Effect (how you grow to like people for whom you do nice things and hate the people you harm). McRaney also reveals the true price of happiness, and how to avoid falling for our own lies. David McRaney is a journalist and self-described psychology nerd. He has written for several publications, including The Atlantic and Psychology Today. He lives in Hattiesburg, Mississippi. "Every chapter is a welcome reminder that you are not so smart — yet you’re never made to feel dumb. You Are Not So Smart is a dose of psychology research served in tasty anecdotes that will make you better understand both yourself and the rest of us. You’ll find new perspectives on your relationships with people you know, people you don’t, and even brands. It turns out we’re much more irrational than most of us think, so give yourself every advantage you can and read this book."